So my friend, Teresa, and I are big fans of the movie Sleepless in Seattle. I mean, who doesn’t love that movie? Okay, who of the female gender doesn’t love that movie? 🙂 So we thought it would be fun to try to find some of the places where the movie was filmed. 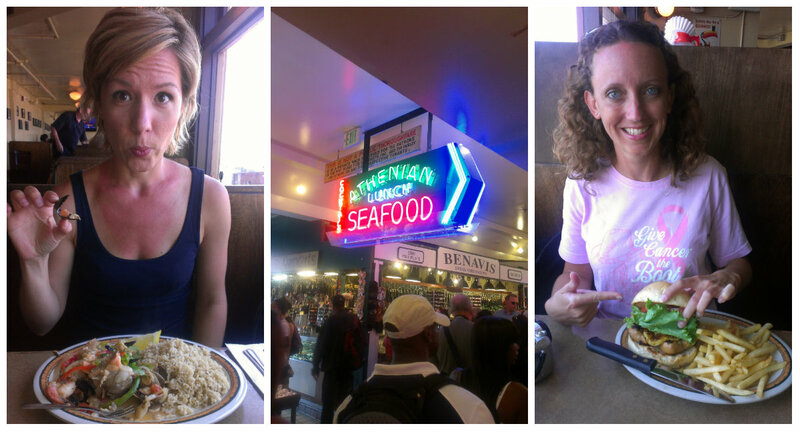 First, was the Athenian Restaurant at Pike Place Market. This was the restaurant in the movie where Tom Hanks’ character, Sam, and his friend are at a bar eating oysters and discussing getting back into the dating scene. We didn’t sit at the bar a la Tom Hanks, but took a table by the windows overlooking the water instead. I had the Seafood Saute which was quite good. 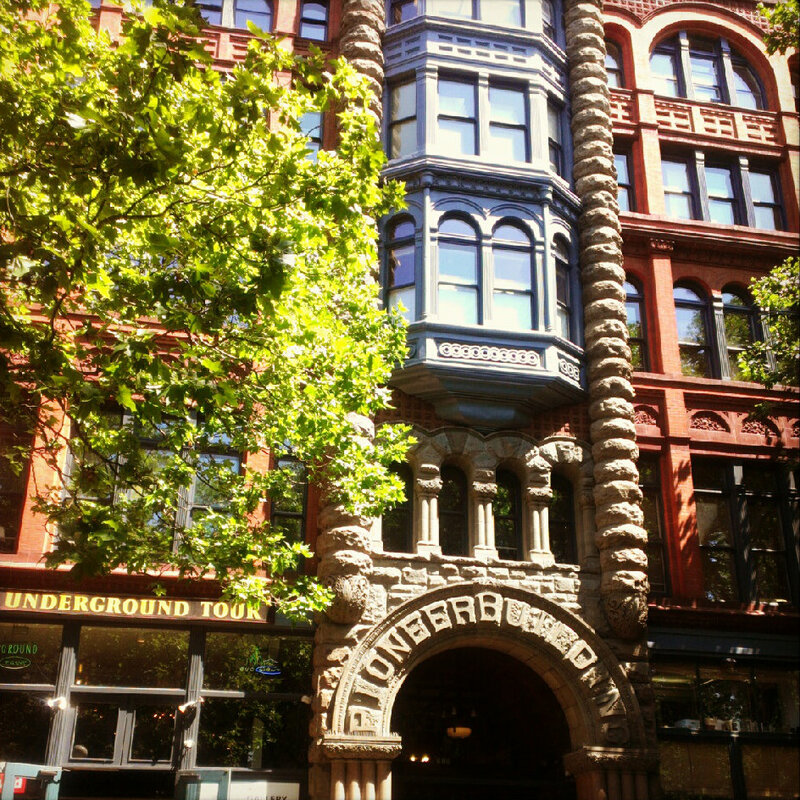 After lunch we looked through some shops and then made our way toward Pioneer Square. 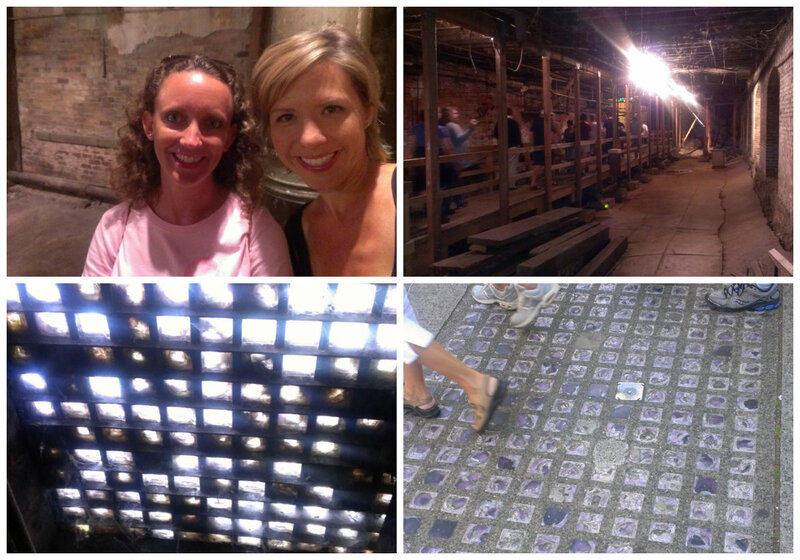 We had heard much about Seattle’s Underground Tour and decided this was something we definitely wanted to experience. The tour leaves from Pioneer Square and literally takes you under the streets of Seattle, to what used to be the streets of Seattle. It’s amazing – the current city of Seattle is built on top of the original city! Our tour guide was hilarious and kept us entertained with many tales of Seattle’s past. It was very interesting to hear the history of this city and why the city decided to start from scratch and rebuild the new above the old. 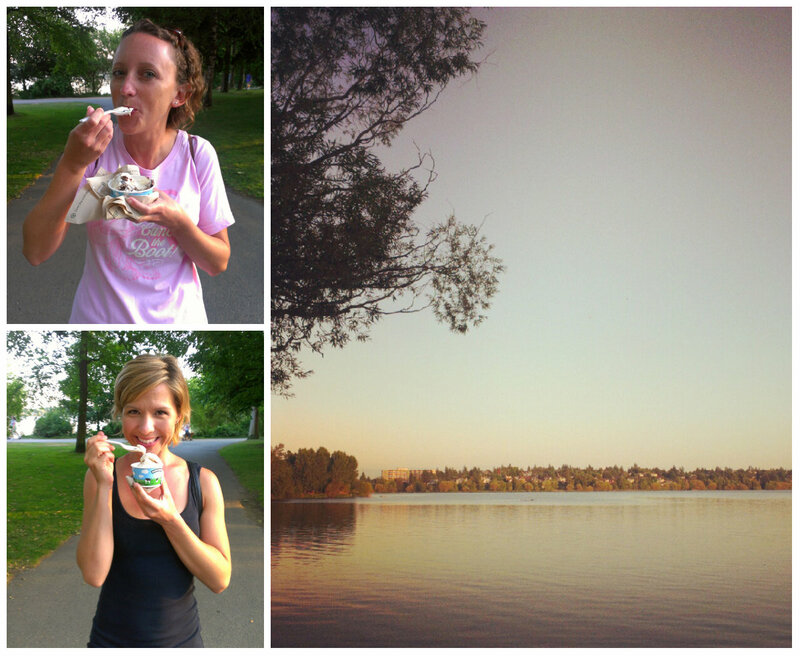 After dinner we took the bus back to Green Lake, bought some ice cream, and walked around the lake. 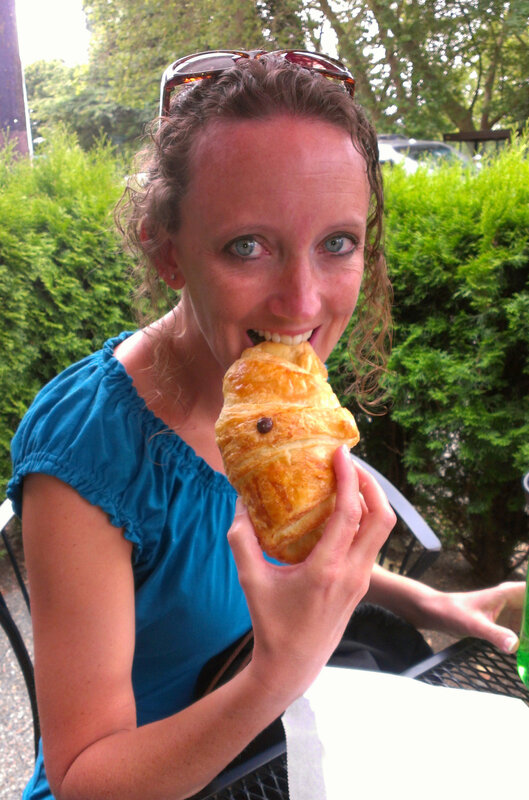 On our final day in Seattle we packed up our stuff, left our luggage at the house where we were staying, picked up chocolate croissants at a bakery down the street (Happy Birthday, Teresa! ), and took the bus into the city to enjoy Seattle one last time. Special breakfast treat for the birthday girl! We went to the Olympic Sculpture Park and walked around the interesting works of art there. Is it just me, or does that tree look like it has eyes on it?? I then led us to Westlake Park which is near the hotel I had stayed at while in the city for work. I had wanted to visit this area again with Teresa so we could get some fun pictures here. And why did I think we could get fun pictures here? 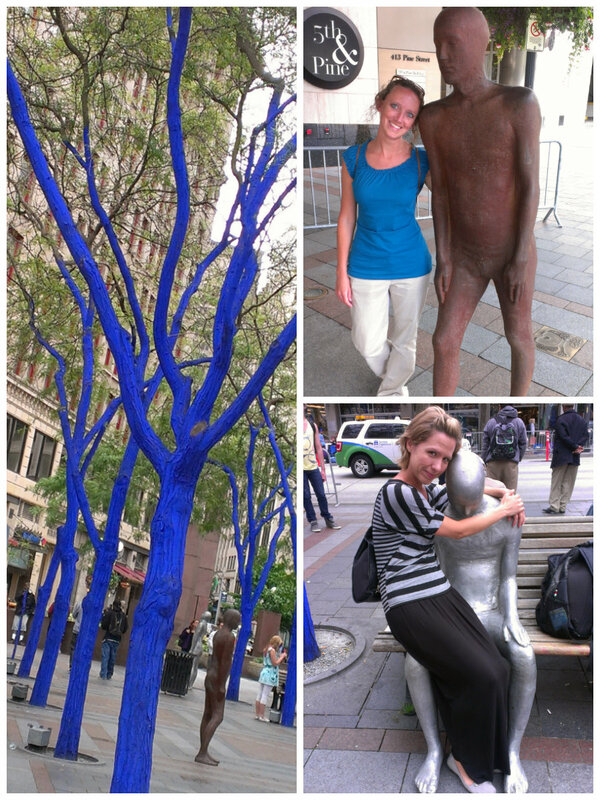 Because this area is filled with 1) blue trees and 2) dozens of human-shaped sculptures. And if there’s one thing Teresa and I like doing, it’s taking pictures with statues and sculptures – usually mimicking them. And we had fun with these! Leaving this area, we headed to the Hard Rock Cafe. It has become somewhat of a goal of ours, to eat at as many Hard Rock Cafe’s as we can while we’re alive. This goal started during our summer in Europe and has continued throughout our travels since then. Fourteen Hard Rock Cafe’s down, 120 to go. Yikes! We had a yummy lunch then went to Pike Place Market to wait in line to order a drink at the original Starbuck’s. Yes, there is a line out the door and down the sidewalk. Always. The people who work here are known to be some of the friendliest around and we can attest to the fact that they really were! We both ordered frappuccinos and took our yummy drinks with us as we walked to Seattle Glassblowing Studio. I am amazed at what people can make using this technique! Seriously amazed! We watched some people working at the furnaces and using blowpipes to create incredible works of art. We looked through their store, then headed to the bus stop. We picked up our luggage from Green Lake, took a cab downtown to the Westlake Station, took the train to the airport (much cheaper than cabbing it the whole way), then ate dinner at Anthony’s (yes, they have an Anthony’s at the airport). Fish and chips again for me! And a wonderful meal to end our time in this fun city. I can’t wait to return someday!! Glad you had loads of fun, can see you enjoyed exploring Seattle. 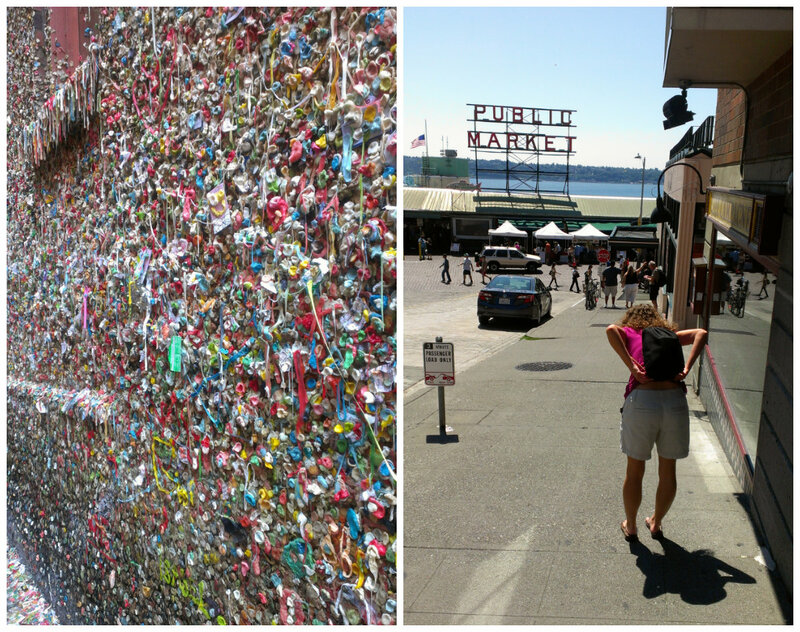 I find the wall covered in gum quite disgusting….can just imagine it melting in the summer heat. So glad you had fun — come back for more. It never rains here in Seattle, you know! Summer extends from Fourth of July to early October! It is beautiful here! But then, I am biased because I was born in Seattle! I love the rain, too. Well I loved Seattle while I was there enjoying beautiful weather, and I think I still would have loved it in the rain! It’s a wonderful city.